Are you afraid of walking past a bakery? Can you hear cakes whispering tempting promises? Knowing they are full of sugar doesn’t make them less desirable. The rich fudgy texture of brownies. Butter melting on a fresh baguette. Scrumptious birthday cake. You don’t have to say goodbye to your favourite treats. Because you can adapt them for low-carb lifestyle. Baking the low-carb way is easy. It is quicker than traditional baking. You don’t need to raise or knead the dough. Just mix the batter and stick it in the oven. And the best part? You control exactly what goes in your treats. No hidden carbs. No chemical nasties. And you can calculate net carbs precisely. Ready to start baking your own low-carb treats? This post answers the most common low-carb baking questions, so you can bake (and enjoy!) your favourite treats again. Without guilty feelings. And without hassle. The concept of low-carb bread seems odd. Surely, bread and cakes are bound to be high in carbs? 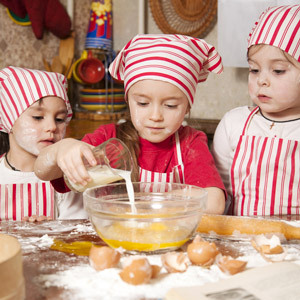 Traditional baking uses wheat flour and sugar. That’s where most of the carbs come from. The secret is you don’t have to use them! Protein is the key. Use lots of eggs and egg whites. Or try adding plain protein powder to your recipe. Low-carb bread can turn out more like a brick than a baguette! But it doesn’t have to. Use plenty of liquid in your recipe – a lot more than in traditional recipes. Your batter should be quite thin. With some recipes, it is pourable. Spend several minutes mixing the batter to incorporate more air. But you might have to compromise a little. And get used to new textures. For breads, expect results closer to heavier rustic multi-seed breads, than a fluffy baguette. It will still work perfectly with pâté, ham and any other topping. A low-carb cake comes out of the oven looking perfect. You’re licking your lips. It looks gorgeous. But the cake hides a shameful secret – gloopy uncooked mass in the centre. Low-carb baking needs longer times at lower oven temperatures, so that the moist inside has time to catch up. Adjust your expectations for cooking times and temperatures. Always follow the directions on your recipe precisely. Coconut flour with sweetener tastes different to wheat flour and sugar. Sometimes we dislike a taste just because it’s not what we expected. If you don’t like the taste of nut flours or sweeteners, add strong flavours to your recipe. Don’t count the carbs inside your head. Even if you are great at maths, your brain will trick you. Humans always err on the wrong side when it comes to food. That’s our evolutionary heritage. Use an app, a spreadsheet, or at least pen and paper. Divide the total number of carbs by the number of servings. So a cake with 1600 total calories and 40g net carbs, cut into 8 slices, will have 200 cals and 5g net carbs per slice. Yummy low-carb treats help you fight temptation. Enjoy your food without breaking your diet. Walk past a bakery with your head held high. What is the best way to store keto baking I find that after storing biscuits, rolls or bread in air tight containers they go very soft and lose any crispness they had. Hi Anamarie, yes, indeed they do! I tend to just loosely cover them with foil and leave them out of the fridge. Sometimes they dry up a bit this way, but that usually makes them taste better. I also put Keto cakes in the fridge without any container or cover, and it seems to be ok. Thank you. All great information. I also greatly appreciate links to specific sources. With diagnosed metabolic syndrome disorder and morbidly obese, my doctor has placed me on a modified Ketogenic program. I have reduced my carb intake, except where white wheat flour tortillas are concerned. Being of Hispanic descent, I need a recipe that doesn’t use xanthum gum or non-gluten flours that have carbs that will cause me to exceed my 5-7 carb gram meal limit. Next option will have to be bariactric surgery in 6-7 months. I really hope Keto diet will work out for you, so that you won’t need the surgery. Best of luck! There are now low carb tortillas available in most store tortilla section. What is the quantity adjustment for the low carb sub ingredients? i.e. The recipe that calls for 2 or 3 cups of regular flour how much coconut flour or almond flour would that adjust to? Most all low carb recipes I’ve tried have substantially less “flour” in them than their wheat flour originals. Any guidelines for starting ratios? My current adjustment question comes from a recipe that uses 2tbs of flour (for thickening a cream sauce (alfredo). As mentioned in the post, it’s usually not as simple as just swapping regular flour to coconut or almond flour. You are right that required quantities tend to be smaller. But there is a lot more to it. Low-carb flours have different chemical properties compared to regular wheat-based flour. So usually you also need to add or adjust other recipe ingredients to compensate for these differences. That’s why I recommend using low-carb recipes rather than adapting regular ones – that takes a lot of trial and error. For thickening sauces, I personally tend to use xanthan gum – you only need a tiny amount for thickening. I also use it in low-carb baking to improve texture and reduce crumbliness. I just wanted to say how thrilled I am to see that you linked to my site as possible recipe source. Thank you so much. You share great information in this wonderful article. Thank you Kim 🙂 I love your recipes and I know how hard you must work in order to keep publishing new ones regularly. Thank you!